As a Ludlow Heating & Cooling customer, you can depend on the safe, dependable, and economical comfort of oil heat. 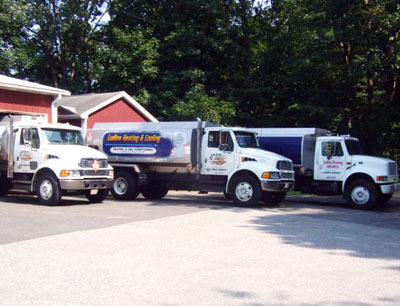 We offer automatic fuel delivery, 24-hour emergency burner service, and budget options that will help make your heating season worry-free. Why should you choose oil heat for your home? Safety: Did you know that if you drop a lit match into a tank of oil heat, it will go out? Heating oil does not explode and will burn only when atomized through a burner. Efficiency: New oil heating systems boast energy efficiency ratings up to 94%. This is better than or equal to natural gas. Ecology: Thanks to conservation measures and the increased efficiency of oil heat equipment, heating oil consumers today use 6 billion fewer gallons of oil each year than they did in the 1970s. Market Size: Millions of homes in the United States and millions more in Europe rely on oil heat for comfort. Germany and Italy, along with the United States, are leaders in the manufacture of oil heat equipment. Service and Quality: Oil heat customers are satisfied customers. According to industry research, 95% of oil heat users are satisfied with their dealer's overall performance and feel they do an excellent job delivering oil and servicing heating equipment. © Ludlow Heating & Cooling, Inc.